Your overall fitness can be greatly improved through hiking. As your heart rate elevates your body becomes more efficient at pumping blood and oxygen. Hiking develops strong, powerful legs by engaging all the muscles in the lower body. Adding a backpack can help improve the strength of your upper body and increase caloric burn. Hiking is a great way to maintain or lose weight. The calories burned through hiking can be as high as 500 to 750 in an hour, depending on the intensity of your hike. Outdoor fitness training can also improve your coordination and agility by walking through rough terrain. Join Maria for our next group Fitness Hike: The ULTIMATE innovative, cutting-edge workout! Enjoy a scenic hike at various local trails with a small group of individuals while engaging in body toning, heart pumping fitness Hikes. Hike through spectacular wilderness trails, past waterfalls and rivers, through fields teaming with wildflowers, or up high mountain ranges. These fitness hikes are designed to provide fitness, nutrition info, hiking training and support in addition to fat burning exercise! Allowing Maria to worry about the route, weather and logistics, leaves you free to focus on enjoying your trip. Maria is entertaining and informative, First Aid and CPR certified, equipped with binoculars, field guides, safety equipment, First Aid kits and extra water. Find the hike that fits your style! There are three different fitness levels of hikes available through Active Nutrition: a Beginner, Intermediate and an Advanced Fitness Hike. In addition Strength Training can be added to most of the Hiking Trail Workouts for additional challenge. Family Guided Hikes suitable for children and private booking of hikes are available upon request. The introductory hike is tailored for individuals who desire fat loss and muscle toning in a relaxed and supportive team environment. This is also designed for those who are new to hiking and want to learn the fundamentals. These beginner hikes take you along picturesque wilderness settings or mountain streams. These hikes are relatively flat or rolling hills 2-4 miles in length. This will provide a good workout for the beginner hiker while enjoying the beautiful scenery at a more relaxing pace. We’ll train in your aerobic target heart rate; this is where you get the greatest cardiovascular benefit. It is within this range that the greatest benefits of regular training are observed, specifically to the cardiovascular system. All of this is done while enjoying some of the most majestic scenery the Northwest has to offer. Are you ready for more mileage and elevation gain? Intermediate hikes provide a scenic workout for those looking to add variety to the workouts by taking cardio workouts outdoors. Intermediate hikes are designed to create maximum caloric expenditure. At this level, overall cardiovascular system is engaged which is great for breaking through performance and weight loss plateaus! For those seeking to get their heart pumping and enjoy the challenge of a more advanced hike, we have many hiking options just for you! Advanced fitness hikes are designed for those interested in high performance training. Advanced hikes cover steeper more challenging terrain and longer distances at a more vigorous pace. Not for the faint of heart, the rewards are wonderful views from the top of Washington. Some elevations over 4000 feet will be reached where you experience a different climate and Washington’s unique high elevation alpine tundra environment. Join us for the ULTIMATE innovative, cutting-edge workout. What better way to get a workout than to do it on our local trails? Strength training exercises are included throughout the hike for full-body muscle toning and strengthening. These workouts allow you to escape into nature while incorporating a heart-pumping workout in the process. You can enjoy the beautiful backcountry while performing push-ups on rocks, pull-ups on trees, or balance exercises on the rocks of a creek. At this level, overall cardiovascular system is engaged for breaking through performance and weight loss plateaus! Spend quality time with your family while learning the basics of hiking with your children. These hikes are a lot of fun and are customized according to your family’s needs and abilities. Maria has instructed dozens of children and adults in safe and enjoyable hiking. For those who desire to have a more personalized experience or the need for a group booking, Maria offers Private Fitness Hikes. She can work with you to design a private hike customized to meet your specific needs - including date, time, locale, fitness activities and even meal selections. Private Fitness Hikes are ideal for celebrities that desire absolute privacy, Mommy Groups, Families, or as a Corporate Team Building Event. Mt. Rainier is the most extensively glaciated volcanic peak in the continental U.S. Camp Muir is used by backpackers who consider Camp Muir their destination and by climbers who will travel beyond the high camp to the upper mountain and summit. 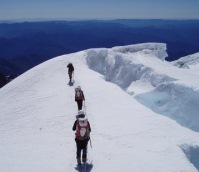 The climb from Paradise (5,400’) to Camp Muir (10,060’) is a full day event. The hike is nearly 4.5 miles one way, and will take 6-8 hours roundtrip. The hike travels through the spectacular alpine meadow zone and onto the Muir Snowfield. The Muir snowfield is climbed for 3,000 vertical feet, opening up vistas of the wooded lowlands and flanking glaciers. The hike requires participants be in good physical condition and is subject to optimal weather conditions for safety. These trips are available to Maria’s most fit clients by special invitation only. Join Maria on one of these adventure trips and explore a new place in the world and within yourself. 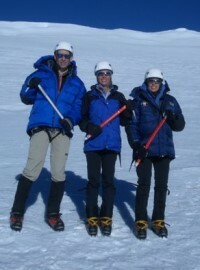 Maria is an experienced climber and has summited most of the Northwest peaks. Mountain Climbs challenge you further by taking you up some of the highest peaks in Washington with breathtaking views. Peak conditioning is a must for mountain climbs. Maria offers complete physical conditioning for mountaineering.